Wayne Dalton Garage Doors, Wayne Dalton Garage Door Repair | Overhead Garage Door, Inc.
Wayne Dalton offers one of the best-defined and high-quality garage doors that we have gained with our years of extensive experience. With our every unit of the garage door, we focus on furnishing the best of our dedication to lifting the overall experience of our customers as ultra-awesome. Not only do we provide the best garage doors to serve the maximum need, but we also expand our role in taking the beauty and elegance and space of your home to the next level. 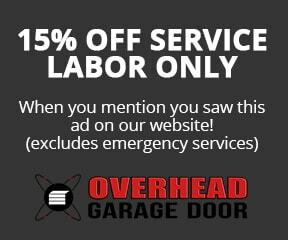 At Overhead Garage Door, Inc. we understand the worth of your hard-earned money, and therefore, make our greatest endeavors in doing the complete justice by taking quality as the most suitable and parallel aspect. Our foremost objective is providing the distinct series of garage door products that undoubtedly can carry the crux of its fitment motive. Quality rammed with strength is our basic fundamental, and we deploy it really well. The scope of customization is another added advantage that we present to our customers for offering the best match to their requirements. From the classy, never-off trend wood garage doors to modern steel, vinyl, aluminum and fiberglass masterpieces, we provide the ultimate ease of choosing the structural layouts, window/panel designs, material and the hardware elements to clutch out the thoughts to reality. Further, we concede and raise the concept of designing the customized garage doors that can match the color pattern of their surroundings and the base defined for their fitment. We cover a wide range of colors and coats to raise the expanse of selection. With a deep urge to obtain the highest level of satisfaction and never-ending craving to perform at the peak of the quality measures, we craft our garage door products extraordinarily to accompany the grace and the safety features in a single slot. The value we put in delivering first-class garage door products can be efficiently exhibited in the way we finish every inch to compose a unique unit altogether, and the robustness we render to make them withstand the toughest of usage and conditions. We appreciate the transition that has steered the traditional wood-crafted garage door designs and patterns to the next level of modern metal-fitted sleek frameless models, and thus, provide the unprejudiced excellence in covering both the perspectives to diversify the excerpt-range for our esteemed customers further. Wayne Dalton removes any of the theories stating that the selection of the perfect garage door is an overwhelming task. We know what sort of issues the customers face and what queries flood in their minds when deciding on the garage doors. To make the overall process simpler, we have the ease of choosing the most suitable doors just in minutes with the help of our Garage Door Design Center or Garage Door Selection Guide. We invite you to have a quick look at what all we are extending and hope to play a significant role in accomplishing your total garage door needs!